Stock stamps are pre-inked and ready to ship directly to you. 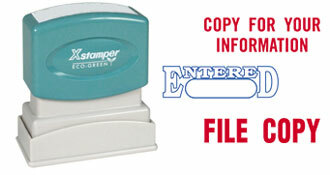 Each stamp holds enough ink for approximately 50,000 impressions before needing to be re-inked. Impression size: 1/2" x 1-5/8"
Don't see the stamp you're looking for? You can design your own with custom text and colors using our Stamp Design Wizard. It's quick and easy.